I’m feeling a tiny bit under the weather lately, which usually ends up in me craving the Chinese food of my childhood. I’ve never been one of those people who don’t like to eat when they’re sick. In fact, I’m the complete opposite, where I’ll pretty much eat anything and everything in an attempt to get better. It’s a twisted sort of logic: I figure my body needs fuel to fight off whatever sickness I have, so I’ll use being sick as an excuse to stuff my face. Usually it’s noodles, or chicken soup, but more often that not, when I’m sick (or even when I’m not), I’ll make myself a big pot of congee. 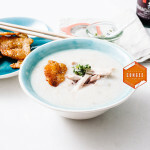 For those of you who haven’t had congee before, it’s a rice soup/porridge deal. Rice is cooked down in water (or stock, if you’re feeling fancy) until it is basically disintegrated. The result is creamy, smooth and utterly addictive. 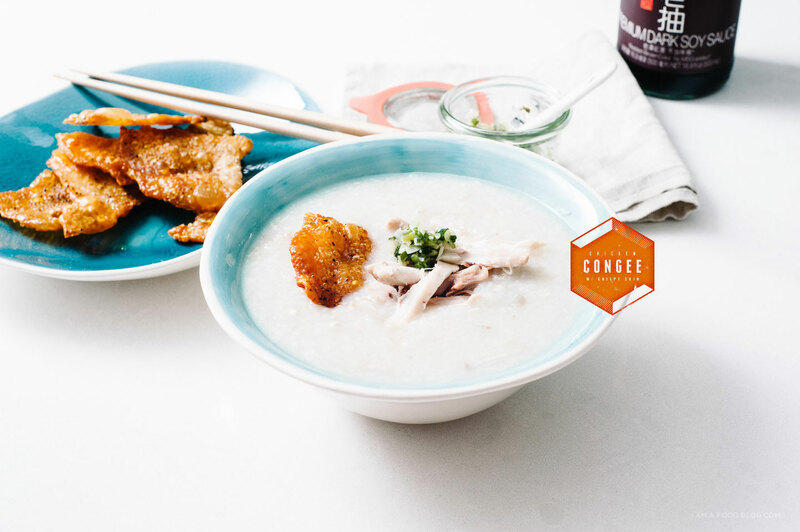 Congee has a super silky texture when you make it right – the starch from the rice goes right into the liquid, making it surprising luxurious for using just two ingredients. The first time I made congee for Mike was a disaster. I put the pot on and promptly forgot about it. We went out for a walk to come home to a slight blue haze coming out from underneath the door. It wasn’t so bad, but the pot was pretty much completely ruined. Luckily there wasn’t a fire, just a lot of smoke. Lesson learned my friends: don’t leave a pot of congee unattended. Also, congee does best on the lowest possible heat. 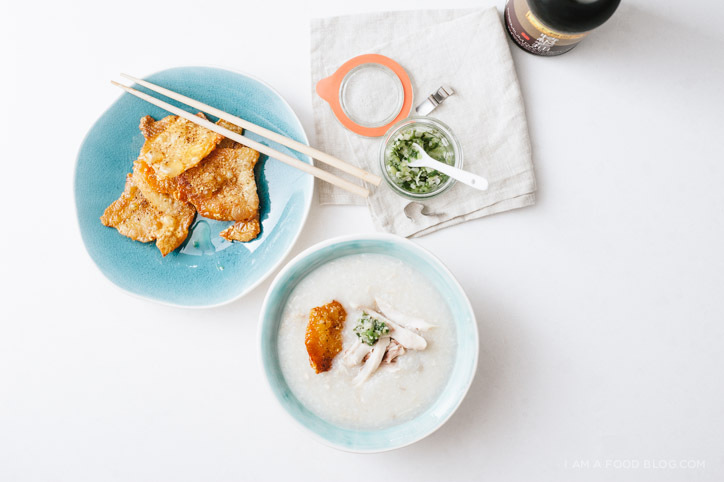 Congee’s a lot like rice (surprise, surprise!) so it lends itself well to other flavours. Here I topped it with some green onion oil, shredded chicken and crispy chicken skin chips, but feel free to throw in anything that strikes your fancy. If you live by a Chinese bakery, do yourself a favour and go and pick up some yao tiew (Chinese doughnuts) – they’re deep fried, savoury and taste fantastic dipped in congee. Add the chicken stock and rice to a large stock pot and bring to a boil. Lower to a simmer for 2 hours, stirring occasionally. After 2 hours all the rice should be broken down and congee should be slightly thick. Congee thickness is a preference. If you like it thinner, add more stock. 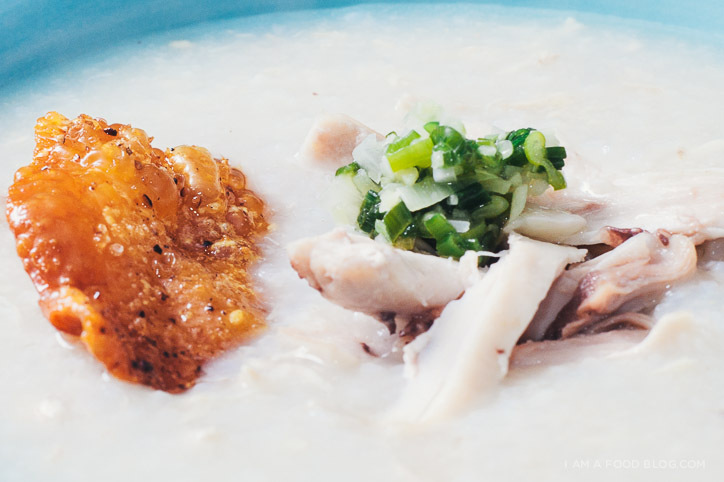 If you prefer a thicker congee, continue to simmer until your desired consistency. Season with salt and enjoy with toppings. 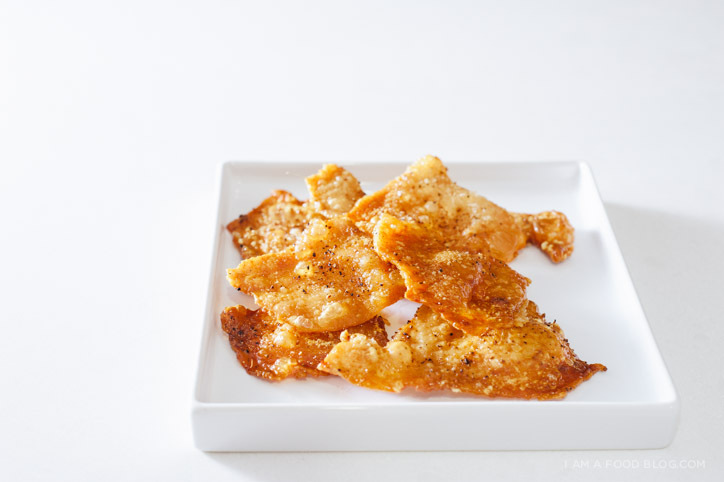 Make the crispy chicken skin: preheat the oven to 400°F. 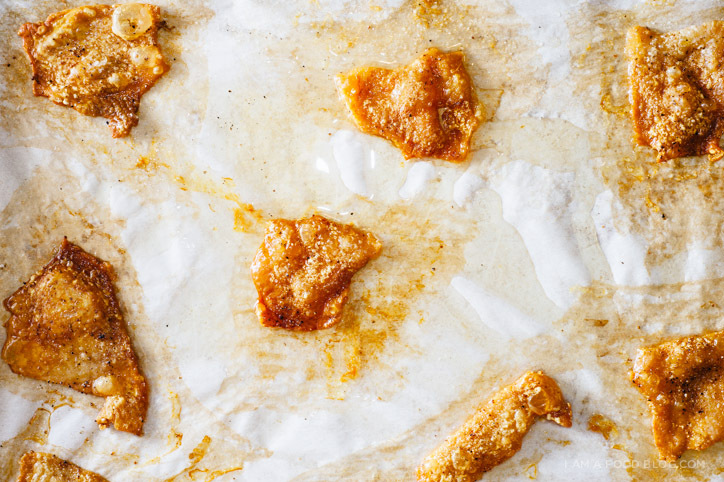 Pat your chicken skins dry with paper towels and lay out on a parchment paper lined baking sheet. Sprinkle with a touch of salt and pepper. Top with another sheet of parchment and put another baking sheet on top. Weigh down with a heavy cast iron skillet or other heavy oven proof dish. Bake for 25-30 minutes and check to see if crispy and browned. If still not crispy, remove the top baking sheet and crisp up for a couple of minutes more. When golden brown, drain on a baking rack before enjoying. Century egg is a must when I eat congee. The ultimate comfort food! Yum! This looks like what I want for dinner but — I’m hungry now, can’t spare two hours! Tomorrow, then :) Feel better! I am creating a food blog for an assignment at university and your blog helped immensely! Plus, this looks absolutely edible! joann, feel free to use chicken broth!